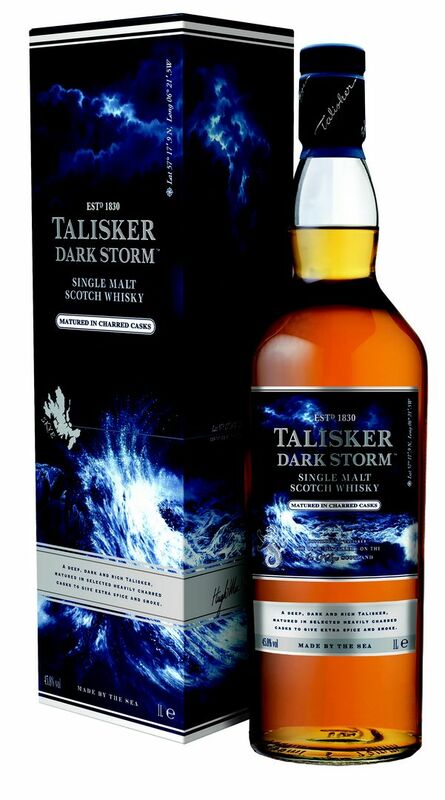 Talisker Dark Storm is a 45.8% single malt Scotch matured in heavily charred oak casks for flavours of blackcurrant, liquorice and powerful smoke. The nose is quite clean and fresh. There is a mixed fruity sweetness with a spicy character. The peat and smoke rise with notes of perfume and thick oak. Hints of Calvados and a touch of acidity with ground ginger. The palate is thick and rich and full-bodied. Notes of spicy, peppery oak, espresso beans and wood smoke. A little allspice creeps in, there is a certain zesty character lurking somewhere. The spice builds and builds with utter intent. The finish is long and with peppery oak. Deep, brooding, amber with blackened copper lights. A rich sweet malt and butterscotch top-notes, backed by seaweed strewn beaches, brine, polished leather, moist ginger fruit cake and a whiff of peat-smoke. Somewhat nose-drying in effect. A sweet and distinctly salty taste, with herbal notes and a warming, lightly smoky finish, after a chilli-pepper kick as you swallow. Becomes more leathery with a dash of water; still some cereal/cake notes, and after a while sweet seaweed. A soft mouthfeel and a sweet and salty taste. Both smoke and chilli are reduced, but still apparent. Lingering salt, smoke and spice in the aftertaste.